Over the last 3 days purple martins have been fledging left and right, taking to the air robustly without a hitch. I have witnessed several nests from both racks fledge and all the parents seemed to be ecstatic. The energy level of the colony is through the roof as the morning social doesn’t let up until well after noon. Birds are flying about in large swooping circles about the colony site. In groups of one youngster to several adults who seem to be guiding the birds into the sky. Several spots on the electrical wires seem to be gathering spots for the youngsters and the rainy afternoons are enjoyed by all. Just enough rain to cool things off but not enough to drive food out of the skies for long. Several weeks ago I blogged about an Screech Owl Tragedy in my backyard. On my 6 (or was it 60th) call to Busch Wildlife Sanctuary, almost a month after bringing it in, I finally got an update on the Eastern (red morph) Screech Owl that I brought them. The owl had a severe traumatic injury of its right wing and unfortunately it was euthanized shortly after I brought it in. I was told that the State (of Florida) “no longer allows amputations” of birds wings above a certain location. SY birds are still looking for homes as I have noticed several birds tonight trying, in vane to be let into a gourd. One continues to sleep on the porch of the Sunset Inn martin house and a couple flew off into the dark. A SY female tried in vane to get into about 5 gourds which was not received well. Fighting and pecking and bickering ensued. The poor girl was determined and I am not sure where she ended up. Though some SY males have succeeded in winning over a handful of gourds, all but 2 of my 31 gourds have eggs or babies. I drive by several know locations of vacant purple martin housing and see no evidence of martins and know that just some minor tweaking of the location of the house is all that stands in the way of quite a few folks getting martins. After 2 seasons now of mailing fliers to neighborhood wannabe landlords, I have only heard back from a handful. In the meantime, I continue to turn away purple martins into the night. I could put up another rack next year but I would much rather show a few how to turn their empty martin houses into active colonies. Other bird news brings 2 fledgling Mockingbirds fluttering about the yard, a family of Common Grackles that I am not sure where they are nesting and a recently fledged Red Tailed hawk being shown the gourd racks this morning by its mother. Sadly a pair of Greater Crested Flycatchers is nowhere to be seen after they started nesting in the recently vacated Screech Owl box. I believe a Horned Owl returned to the box as I found a large Owl feather clinging to the front of the nest box the same day the Flycatchers disappeared. Now to fashion Owl guards for that nest box. Last year I wrote a blog post called SY Males-The Enemy Within. It dealt with some of the facts and dangers that Purple Martins face from their own kind. 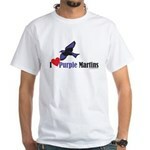 SY or subadult male purple martins, arrive later than the ASY martins. They return home having survived the migration only to find all nest compartments full or guarded by protective ASY males. Eggs and nestlings run the risk of being destroyed or killed by the younger SY males. These males are so eager to breed that they will kill their own kind to force the females to start a new family. Today I found the first casualty and my nest check results show that several nests have been affected by these SY males. The first tip off is a compartment previously claimed by a ASY pair is now protected by a SY male. Eggs or nestlings on the ground are dead give aways of course and the bickering and fighting can get intense. Though unless witnessed, you may never really know what was the cause of eggs or nestlings that mysteriously disappear, in the absence of sparrows and starlings, one can assume that SY’s play a part. Can something be done about this? Well, many people wait until the SY males arrival to open up some of their housing. Others put up temporary type housing to alleviate some of the nest site competition like the Trendsetter Create-A-Rack Arms that can be added on to your telescopic pole to make an affordable and easy spot to hang a few extra gourds in a pinch. Still others may yell and shoo those pesky SY males away. In the grand scheme I suppose I tolerate this behavior in my colony as the ugly harsh reality of survival. If a ASY male is off guard and not protecting his mate and nest, his gene pool suffers. Those males that are dutiful in their jobs as protectors can drive away would be dangers and their off spring survives. It is a hard thing to witness and if I witness the tossing of a nestling I will intervene and return it to its nest. Is that what National Geographic would do if they were filming a documentary? No, they would probably film it happening and talk about the harsh reality of nature and watch death come slowly. Is that interfering with nature? Or is it our nature to interfere?